We some exciting news to share with you! 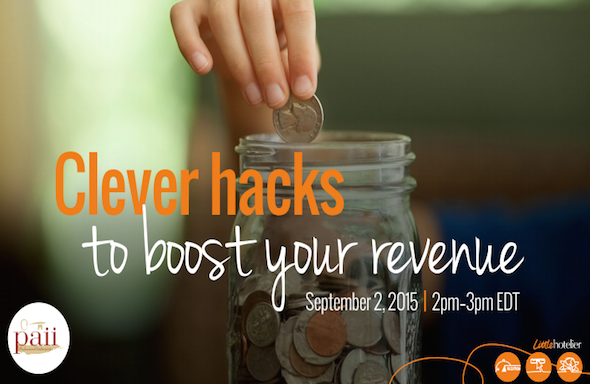 Little Hotelier has joined forces with the Professional Association of Innkeepers International (PAII) to bring you this free webinar: Clever Hacks to Boost Your Inn’s Revenue. On the 2nd of September, 2015 @ 2pm EST, we will cover the basics of yield management, some pricing strategies you can use to boost revenue, and tips on how you can measure your success. Unfortunately, this webinar is for PAII members only. Webinar seats are limited, so save your spot today. If you can’t make it for the live webinar, register anyway, and a recording will be sent to you afterwards. The only drawback is you won’t be able to join in the conversation and ask questions on the fly. Watch our version of the webinar! Below is some of the information that we cover. Forecast the upcoming booking season. When you implement yield management strategies, you take advantage of the fact that different guests are willing to pay a different price for the same resources. What are some yield management strategies you can use? You don’t have to be a large hotel chain to increase revenue through successful yield management. There are strategies you can implement today at your small hotel, bed and breakfast, inn, or guesthouse. You should never have just one fixed set of rates. You can have your regular rack rates, group and tour rates, special and promo rates, and package rates. Your regular rates should also change depending on timing. Rates can change according to season, day of week, time of day, peak times, and last minute bookings. You should be attempting to enhance your guests’ experience through extra offers and services. Complementary offers that will enhance their experience include shuttle transfers, room upgrades, equipment hire, and tours and activities. For complete tips, you can also download our free ebook on revenue management.